Many of us detest making decisions. We ‘sleep on it’, think about it and still hesitate to make a decision. 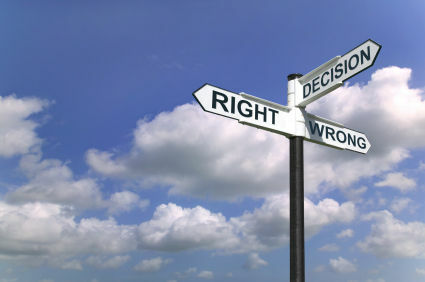 Nobody said decision making is easy, but it is something that must be done from time to time. In a chama, there comes a time when you have to decide on how to handle some issues. So, is the role of the Chama leader to make decisions or make sure decisions are made? The truth is, decision making within a chama is not done by one person but rather a situation where the leader engages the members to making a decision. A ladies only chama that comprised of 10 women needed to replace a member who had just left the group to pursue other interests. The members had strived to search for a suitable lady to join the group in vain. Someone said that they had identified a gentleman who was interested in joining the chama. Making a decision on whether to accept this person or not required engaging each member and getting their views on what they felt about this. While it would have been easier and faster to simply weigh the pros and cons of each issue and then give directions, the chama leader realized that her members understood the implications better than she did, and if they didn’t fully support the decisions, the execution might be compromised. So everyone had to be engaged. The problem was that the members all approached the problem differently and trouble reaching a consensus so they kept pushing the decision back to her instead of discussing it among themselves. The leader became a bottleneck in the decision process, and everyone in the member became frustrated at how long it took to get things done. To break this jam, the leader pushed back the decision by asking a series of questions: how will this affect our Chama? Apart from the leader, who else needs to be involved in this decision? What’s stopping the Chama members from working with each other and figuring out the right thing to do? By doing this, the Chama members began to work through problems and issues with each other first, and expected fewer decisions to be made by the Chama leader. Your work as the Chama leader is to make sure that decisions are made and implemented for the Chama. And while it may seem easier to just make the decisions yourself, in many cases this won’t lead to the best outcome. The alternative, however, is not to shy away from decisions, but rather to created a harmonized process by which all Chama members are engaged, including yourself.